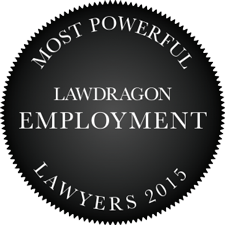 Lawdragon is proud to present the 2015 Guide to Most Powerful Employment Lawyers, the result of hundreds of law firm submissions and editorial research conducted over the past year. This is the eighth annual guide to leading employment lawyers we have produced in partnership with Human Resource Executive (HRE) magazine. In addition to the 100 Most Powerful Employment Lawyers below, you can also view the Top 20 in Employee Benefits; the Top 20 in Traditional Labor & Employment Law; the Top 20 in Immigration; 40 Up and Comers in the field; and, for the third year, a Hall of Fame list. Rosemary Alito K&L Gates Newark, N.J.
Fred W. Alvarez Jones Day Palo Alto, Calif.
Paula A. Barran Barran Liebman Portland, Ore.
Charles S. Caulkins Fisher & Phillips Ft. Lauderdale, Fla.
Vincent A. Cino Jackson Lewis Morristown, N.J.
Robert W. Horton Bass Berry & Sims Nashville, Tenn.
Thomas G. Kienbaum Kienbaum Opperwall Hardy & Pelton Birmingham, Mich.
William C. Martucci Shook Kansas City, Mo. Armin J. Moeller Jr. Balch & Bingham Jackson, Miss. Steven W. Suflas Ballard Spahr Cherry Hill, N.J.
Allan Weitzman Proskauer Boca Raton, Fla.